The first in an occasional series of reader's essays. The city of Sarajevo has recently had an anniversary. Five years after the end of the epochal 46-month siege it endured from 1992 to 1996, Sarajevo still wears its disrupted history heavily on its sleeve. 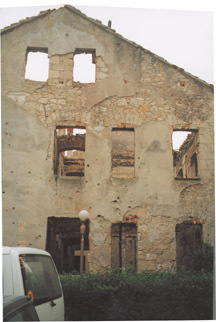 Postcard stands around the city unflinchingly display image after image of the war: The still-standing but crumbled remains of the daily newspaper building, now a public monument that lies along a main city thoroughfare known during the war as Sniper's Alley. Endless vistas of gutted modern high-rises, pockmarked Hapsburg-era apartment buildings, and de-spired mosques (each scene peppered with buildings torn completely asunder). Wreaths on the sidewalk at the Markale Market, where red wax fills the cracks, a poignant symbol for the blood of those killed and maimed in the bombings of this pedestrian zone. Sarajevo is not afraid of its own shadow. It has no choice but to confront it, and it does so with candor. One of my most treasured postcards from Sarajevo was sent to me from my brother, who worked there on one of the city's numerous international economic development projects. 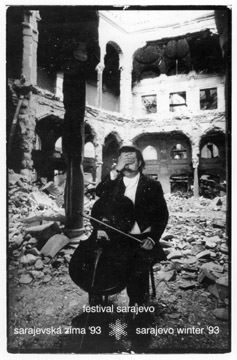 A tuxedoed cellist sits with his instrument amidst the ruins of the National Library. One hand obscures his eyes and forehead, while the other holds the bow. He doesn't play. Behind him, ghostly fragments of the building's once grand arches remain standing above piles of rubble. The postcard announces the city's 1993 music festival. The library had been longtime host to the city's chamber music events. The building and most of its collection are now immutably lost. I traveled to Sarajevo in January 2000 to perform a benefit piano recital for the Music Academy. The multi-story building, near the old city center, is still bruised (most shockingly by a large hole in an interior wall between the recital hall and the corridor). The hole is covered on both sides in Plexiglas. There is no plan to repair it, a decision that seems to have been the idea of the Academy's dean, Faruk Sijaric. It welcomes visitors with an imperative: No one here will forget. My family and I made our way into Sarajevo inauspiciously, 10 days after the heaviest snowfall in over 100 years. The city was reeling from it when we arrived, and still reeling 10 days later when we left. I practiced at the Academy during the days, sometimes, while waiting for an empty room with a piano, chatting with the Academy's secretary, Larisa Dozo. Larisa daydreamed about getting out of Sarajevo ("to Australia . . . no, New Zealand!" ). The first room she gave me the key for was on the top floor; it had a skylight and no heat. I could see my breath, and playing scales became necessary for warming up physically as well as technically. My performance turned out to be a memorable event, but not for the reasons one might expect. I often like to speak briefly about the music before I play. On this occasion, a translator was arranged for me, one of the most well-known in Bosnia-Herzegovina. She asked me before the recital if I wouldn't mind excluding overly technical terms, as she was not a musician. As I spoke about the short piano pieces of Johannes Brahms, I described how one was marked by the intermingling of several different rhythmic and metrical levels. I demonstrated each element with a brief example from the piano. I thought everything was going well. But as my translator and I neared the end of my demonstration, a man in the front row spoke up and addressed her. Having no knowledge of Serbo-Croatian, I didn't know what he was saying, but I was a bit startled that an audience member would talk back at a piano recital. My translator responded in a cordial tone, but the man countered more insistently. At this point, murmurings began in the back of the room. As the exchange continued for a moment longer, the crowd began to exude an uncomfortable energy, suggesting that what was going on between the translator and her heckler was going too far. I felt a ripple of anxiety. My only real option was to begin playing, so in the middle of the dialogue, for fear of a true outburst from the back of the room, I simply launched into the Brahms set. My brother, who was in attendance and who speaks the language fluently, told me later that the man was a professor at the Music Academy and was correcting the translations. I immediately felt guilty and responsible, and I was left wondering, and still wonder to this day, what lay behind the unnerving episode. On the recital's second half, I played Beethoven's Appassionata Sonata. Somehow, during intermission I had managed to ease myself back into the frame of mind necessary to make convincing music. The audience was utterly silent throughout; they seemed gripped by the piece. Part of me likes to believe it was my performance. But upon reflection, I think it had more to do with the piece itself. Absolute instrumental music can be representational, but only in mystifying ways. The Appassionata, composed in 1804-05, is one of Beethoven's most visceral and unflinchingly pessimistic statements. It speaks, among other things, of the torment of individual life in the modern world. At the core of the first movement, for instance, is a unifying motive, evocative of the familiar motive from the opening of his Fifth Symphony. This motive (at times baldly stated without accompaniment, while elsewhere submerged under a violent flood of minor-key arpeggiations) represents fate. The first movement, in F Minor, poses the narrative problem: What does fate have in store for me? For us? The second movement, in the falsely redemptive key of Db Major, is a representation of transcendence. A wordless hymn, in four-part harmony, is treated to a series of variations. Its note values, quarter notes to begin with, incrementally speed up to thirty-second notes. At first solemn, the hymn transforms before us. In the second variation, it caresses; in the third, it bubbles ecstatically. The variations climb the keyboard, the texture finally bursting at its seams at the top, spilling over in a torrent of optimism. A deeply historical sense of conflict courses through Balkan blood. I learned this, of all places, at a piano recital. In Beethoven, however, such moments are often only fleeting. And sure enough, the third movement, the denouement, follows without pause. Filled with turbulent swells, this final movement provides an abstract representation of inexorability: perpetual motion with only one interruption, a moment that produces one of the most unabashed musical "question marks" in the literature. And, in the end, two pages of rapid-fire chords and hair-raising figurations, which a musician friend of mine once described as sounding like a frenzied dance on a grave. Beethoven's mastery of musical rhetoric makes his dramatic point hard to miss. Never content to let the listener slip into complacency, and never satisfied unless he had thoroughly explored the possibilities of a musical subject, Beethoven created music full of abrupt, often rude changes of mood, texture, and dynamics. They are, in a way, schizophrenic moments, quintessentially modern moments, moments that might speak directly to the heart of someone who has lived through the kinds of horrors experienced by the people of Sarajevo. For me, as a performer, the real interest in the Appassionata's representation of relentlessness lies in the fact that each listener must shape his or her own impressions of what, exactly, is inexorable. Is it the progress of civilization? A certain violence inherent in human nature? The individual life cycle? Human suffering? I wondered what my late-20th-century Bosnian audience found in it. Now that I've had some time to think about it, my choice of the Appassionata and the strange incident with the music professor and my translator go hand in hand: A deeply historical sense of conflict courses through Balkan blood. I learned this, of all places, at a piano recital. Sarajevo is an easy city to romanticize. It is spectacularly remote, landlocked in an isolated mountain valley. Its culture (its food, its architecture, even its citizens' dispositions) is marked by a fascinating mixture of the Slavic and the Mediterranean. Its history in the 20th century is framed by two violent bookends: the assassination of Archduke Franz Ferdinand by Serbian nationalist Gavrilo Princip in 1914, which gave rise to World War I, and the historic siege of the 1990s. Its history in the 21st century is beginning with the painstaking and unsure road to recovery. I returned to Sarajevo in October 2000 to perform at the Music Academy once again. This time around, nothing unusual occurred at the recital. And, to be honest, I found myself unable to conjure up the romanticized image of the city that I had brought there on my first visit. The harsh realities of life were more apparent to me as a returning visitor. I played Beethoven again, this time a sonata from his early period, the D Major, op. 10, no. 3. There is an exquisite moment in this four-movement piece, when the D Minor second movement (marked Largo e mesto, with a despairing theme), gives way to the third movement, a graceful dance in 3/4 time. The key changes blissfully back to the major key, and Beethoven gives us one of his most understated and heartwarming melodies. The music is smiling through its tears. I found myself on stage, in Sarajevo, thinking to myself that this moment, which signifies the antithesis of the Appassionata's violence and doom, also might speak to the Bosnian heart. Forging a happy and normal life amidst ruin is exactly what the citizens of Sarajevo have found themselves learning to do. Mark Mazullo (Peabody '91) is assistant professor of music at Macalaster College in St. Paul, Minnesota.